– The following post-practice quote from Ryan Miller explains a lot about what’s going through his mind while he’s in the crease. I like that he’s able to share these technical aspects of his game with the media and the fans. And he’s right, the past couple of games, he’s played like that elite goaltender that we know he is. But in regards to the golf aspect, maybe Ryan needs to take the advice of the founder of the Dewey Addem & Howe Golf Outing: grip it, rip it and open a cold one afterward. Golf is supposed to be fun (And so is hockey for that matter. Even when you’re getting paid to play it). – I got a chuckle out of hearing that Rhett Warrener showed up at the rink dressed as Darth Vader the day after his son Luke was born. (Doing so shows just enough of an understanding of the absurd, and I love it.) Rhett was a good egg and I miss having him on the Sabres, though if reports out of Calgary are correct, it seems like Rhett could be hanging up the skates soon. He was one of those guys (same with Jay McKee) that put the body on the line every night and didn’t run away from the hits. – Anyone want to speculate on what the over/under is on Vinny Lecavalier heading out of Tampa before the trade deadline? If Tampa’s interested in a couple of UFA’s, maybe we could interest them in Timmy and Max? (Yes, I know that management would freak at having a Vinny contract on the books, and so this is only a pipe dream). I’m sure Max would love Florida if only because he would be closer to the tennis player girlfriend, and the Florida weather might do wonders for Timmy’s constitution. – And Yahoo still hasn’t put Ales Hemsky on the IR. I’m not a happy camper over here. Let’s take a look at this year’s playoff matchups. This analysis is going to be completely unscientific, and kind of sad, since there’s no Buffalo included in any of the matchups. I bear no responsibility if you go and bet the house, kids and dog on anything that you read here. – Montreal’s been on fire lately, and Boston played listlessly its last few games. The fans in Montreal also get more into the game than those in Boston. The Habs game against the Sabres was probably one of the loudest games I’ve heard this year. The crowd was in post-season form already. The only downside is that the “Ole” song gets stuck in your head for awhile after watching a Habs game. The Pens proved this season that they are not all Crosby, all the time. Most of the NHL predicted that they would flounder when Sid went down with his ankle sprain. Instead, Sid’s teammates – most notably Malkin – stepped up to the plate, and not only kept the Pens in the playoff picture, but propelled them to the top of the conference. Not bad for a bunch of kids. And who would’ve thought that Conklin would play so spectacularly well when Fluery got hurt? The fact that Marty shut out his opponents in the Phylers last two games means that he’s going to turn into a human sieve against Ovie and Co. Philly has a potent offense when they can figure out how to make it work, but they’re most known for their goonery this season. Marty’s been anything but consistent, and I smell doom for him. On the Caps side, expect all Ovie, all the time. And the media will probably regale us with the tales of how Ovie is the first person to ever celebrate a goal, and how his celebrations are so joyful. Despite that, the Caps did a great job turning their season around. Bondreau (did you know he was in Slap Shot?) did a great job of righting the Capitals ship. Oh, those wacky Devils. Marty’s solid in net. The team has more defenders than they know what to do with. They’ve got solid leadership in Langenbrunner and Pandolfo, and a lot of young talent in Zajac and Parise. They’ve somewhat managed to overcome their reputation for killing hockey and/or their coaches to finish a solid fourth in the conference this year. The Rangers bug me. They’ve got two slag-faced whores on the roster in Drury and Gomez. And they’ve got Sean Avery (who was really amusing me during the Devils game due to his trash-talking with Madden and Clarkson) who perpetually manages to annoy the crap out of fans and opponents alike. And people act like they’re god’s gift to hockey because they’re the Rangers and they play in NY. Yippee. That said, I’m going with the Devils in 7. 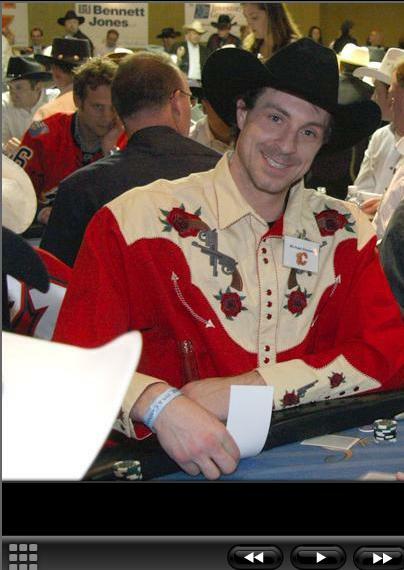 We’ve all had our fair share of thoughts on Crunchy’s wardrobe, and Derek Roy’s pimpin’ fashion, but this shot of Rhett Warrener takes the cake for worst apparel item to be worn by a hockey player. I know it was at a charity event (at which the Flames raised over $400,000 CAD), but it definitely is not a good sartorial choice for Mr. Warrener. And I used to love Rhett Warrener when he was here. His partnership with Jay McKee (Rat and Cheese, they were called) made up the core of the Sabres defensive corps. He always seemed so lighthearted to the press, even during his quarantine with Soupy during the SARS scare. However, any residual love is being swallowed up by the shirt that ate Calgary! Remember hockey players, just say no to ugly shirts! In closing, I found this post on Fanhouse. Golden Griffins represent! Good to see the alma mater’s hockey team in the news for something hockey related instead of something scandalous off the ice. You are currently browsing the archives for the Rhett Warrener category.